The 10 Best Bagel Shops in Maine! Maine’s bagels compete with the best of the best. Shops across the state serve up fresh-from-the-oven classics that will start your morning off just right. Try all the perfectly-textured, hand-rolled bagels your heart desires at these 10 great bagel shops in Maine. Saveur Magazine recently declared the wood-fired sourdough bagels made at Forage Market are one of the best bagels outside of NYC. Bagels are made simply of flour, water, malt, and salt then hand rolled, aged, and fired in the brick oven. They are just divine. 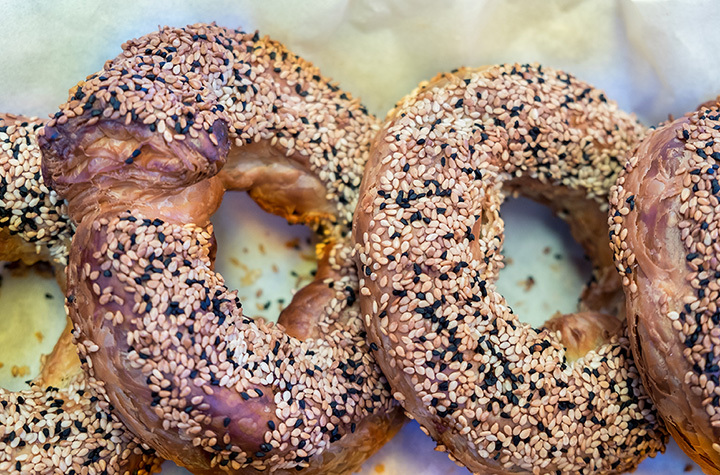 Bagels at Union Bagel Co. in Portland are baked with quality ingredients and organic flour. These full flavor and rich texture bagels are hand rolled, boiled, and baked in the stone hearth. Bagel flavors range from plain to garlic to cinnamon raisin. If the shop is sold out, many of the local coffee shops carry Union Bagel Co. bagels. Bagel Central has the best bagel selection in Bangor. Bagels are made daily by hand in an assortment of flavors like poppy, blueberry, apple-cinnamon, and marbled rye. Either pick up a dozen or enjoy a bagel topped with one of the famous bagel toppings. Vegan or gluten free? Bagel Central has you covered, too. This cute little café is a hotspot for young college students and locals alike. Get there early as the café closes once food sells out and it does quickly on the weekends. While you can certainly order a plain bagel here, you need to try one of their delicious bagel breakfast sandwich like the Capone or Hogzilla. Ask any local and then will tell you the best bagel in Maine can be found at Bagel Mainea. The locals are right. Bagel Mainea has been voted one of the top 10 bagel shops in New England. Over 30 varieties are available daily and you’ll definitely want to pair your bagel with one of their homemade specialty cream cheeses and spreads. Mister Bagel is a staple of southern Maine. In fact, the Mister Bagel shop on Forest Avenue in Portland opened in 1977 was the first bagel bakery in the state of Maine. Today, there are 12 locations throughout the Greater Portland community. Not only does Mister Bagel make its own bagels, but also its cream cheese spreads. Always ranked as one of the best bakeries in Maine, Scratch Baking Co. is a small artisan neighborhood bakery in South Portland. Every morning, a team of bakers arrive at 3 a.m. to hand cut, hand roll, boil, and bake dozens of your favorite bagels. Get there early as the bagels sell out fast. If you don’t have the time to drive five hours north to Montreal, you can find Montreal-style bagels at The Purple House in North Yarmouth. The bagels here are always hand-formed, boiled with honey, and then baked in a wood-fire oven. Get there early for a warm melt in your mouth taste. Head to the Bagel Basket in York for freshly baked New York-style bagels. With over 18 different flavors from asiago to French toast to spinach, you’ll have lots of options to choose your favorite. Try a bagel with one of their homemade spreads or as a sandwich for breakfast or lunch. Maple’s serves everything from gelato to pastries to bagels. Bagels are made daily and sell out fast with recent recognition from local New York transplant chefs.